The cash carnival at 888 Casino just got bigger with the arrival of the new and exclusive Treasure Fair online slot. Developed by Random Logic and boasting 25 pay lines, Treasure Fair is a mysterious and very cool progressive jackpot slot. It offers plentiful bonus features and rewards including a payout parade of up to 1500 coins. Roll up, roll up, get your tickets now for mobile or desktop, play one of the best exclusive slots at 888 Casino UK. 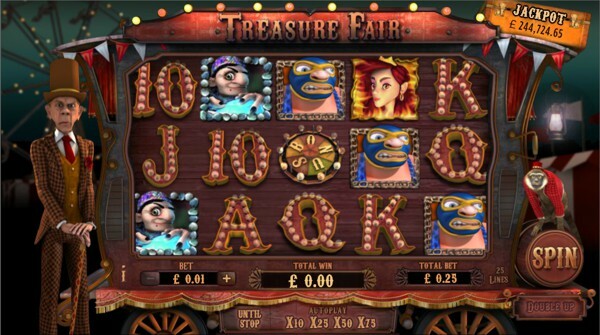 Treasure Fair is a carnival themed online slot developed by Random Logic exclusively for the 888 Casino. The game plays out on five reels, offers 25 pay lines for betting players and has a built-in progressive jackpot. The graphics are some of the finest while the sound and supporting animation gives the Treasure Fair an exciting and creepy vibe. What also works is how the game uses fun carnival acts to host the various bonus features, multipliers, free spins and exploding wilds. It is currently one of the most popular jackpot slots at 888 Casino for UK players. It is mobile responsive and has a performing payout rate of 94.82%. The Treasure Fair Slot Jackpot is the random progressive jackpot that grows at a rate of 1% your game bets; that’s everyone else’s bet too. This huge cash prize pays out randomly. And doesn’t require any symbol combinations to win it and can reach hundreds of thousands of pounds. 888.com now suspect that Treasure Fair will become one of its most popular UK slots for its progressive jackpot alone. 888 slots get the full Random Logic works, and Treasure Fair is no exception. Designed and built for today’s demanding real money players, it’s a game that’s completely mobile responsive and totally user-friendly. You can play the exclusive Treasure Fair mobile slot for iPhone or iPad with superb IOS compatibility and graphics, and it’s just as good on Android. Want the bigger display and more user controls, opt for the Treasure Fair slot on desktop and you won’t be disappointed. Major plus points include the detailed illustrations. With crisp animation and supporting audio that helps generate the slots eery atmosphere. Along with extremely flexible betting margins. In terms of playability, 888 Treasure Fair is a credit to the top UK casino. 888.com didn’t want the standard run of the mill game, and they didn’t want 888 mobile casino players getting bored either. Random Logic do their best to engage the user with multiple scenarios within and above the base game, scenarios that include Free Spins, Sticky Wilds, and Exploding Wilds. The reels include various winning symbols from the fun fair and carnival genre. The Treasure Fair Slot is more twisted than the circus and more freaky than it is fun. Lower payout symbols include the illuminations of card values 10, J, Q, K, and A but they still pay well. If you’re playing 888 slots for real money and want the bigger wins, symbols like the strongman, fortune teller, fire-eater and a clown are amongst the better values. The highest value symbols are the Wild, Exploding Wild and the Wheel of Fortune bonus symbols. These symbols can increase winning capacity and trigger the Treasure Fair Slot bonus rounds and features. The slot is bonus heavy on desktop or mobile, and then of course there’s that progressive jackpot. The Wheel of Fortune feature is the slots main bonus game and is triggered by three bonus symbols. Players now get to spin the Wheel of Fortune which will determine one of five bonus games and the associated multiplier on any winnings. Each game gets represented by a character from the fun fair and involves icon selection to win a cash prize and a multiplier. The Wheel of Fortune bonus is now one of the most rewarding features associated to slots at 888 Casino UK, and also one of the biggest. The Treasure Fair Slot for mobile or desktop has an improved Wild capacity with Standard, Exploding and Sticky Wilds all inclusive. The standard Wild is there to help generate wins and will substitute for all other symbols except the bonus symbol and the Exploding Wild. The more powerful of the Wilds is the exploding variant found only on reel 3; this generates 2 – 4 Sticky Wilds and distributes them across the other reels. Players then receive free spins while the Sticky Wilds remain in place hoping to catch further winning combinations. The Treasure Fair Exploding Wild is one of the best of its kind. The Gamble feature is a coin toss and potentially one of the most rewarding bonuses found in the 888 UK slots line up. It’s double your money if you can guess heads or tails correctly, and up to £100,000 for the highest possible payout of this game. You might need a fortune teller for the Gamble feature, could come in handy. Real money players who deposit to play Treasure Fair will bet alongside 25 pay lines with levels of between 1p and £10 per line, or, spins from just 25p to a more modest high-rolling £250 per bet. The highest paying symbol within the game or the games base jackpot is 1500 coins. In the Gamble feature, players can double their money up to 4 times to a whopping maximum of £100,000. The progressive jackpot could even pay more than that figure. The payout rate for Treasure Fair is a lower than average 94.82% RTP, but the bonus rounds do trigger at a much better rate than most other 888 slots. 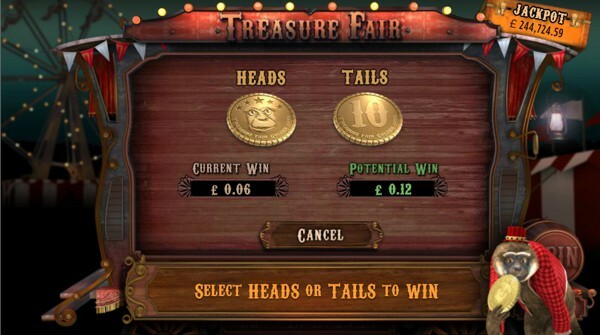 While 888 Casino UK might be well known for its no deposit bonuses and free play slots, Treasure Fair sends a clear message to the real money players, the Carnival is open for business. Not only is Treasure Fair exclusive, it’s also hugely rewarding for winning players. Random Logic’s twisted and heavy bonus progressive is a great looking game that brings fresh appeal to the 888 slots collection. You can also play the Treasure Fair Slot for iPhone, iPad or Android at 888 Mobile Casino.